Members of the Ealing Council Regeneration team cycled to Cannes, France this week to attend MIPIM, an international property market. Pat Hayes and Brendon Walsh arrived by bicycle on Wednesday, after six days cycling. According to the website Ealing In London, set up to market Ealing to potential investors and developers, the Regeneration Team from Ealing Council launched the 'procurement of a design and build contractor for the Acton Town Hall Service Centre - an exciting £16m project" this morning at the Market. On Tuesday this week, residents and interested parties went to the Priory Centre to see the plans and make comments on the next stage of the project to upgrade and modernise the Acton Town Hall complex. Local MP Angie Bray visited the Centre to view the plans. According to a press release, Ms Bray met with Julie Saunders, Director of Theatre Studio West, to discuss the plans to move existing groups from the Priory Centre to the new Town Hall development. There is concern that space allocated for community services in the newly refurbished Town Hall in no way matches what they enjoy at the moment, and will likely prove unworkable. She also pointed out that it can only be reached by stairs which will make it difficult for many people to access. But their biggest worry at the moment is that plans for the Priory Centre, which include building a new primary school there, may mean that the groups are pushed out of the Priory Centre before their new home in the Town Hall is actually ready. Plans for the site include the provision of a new 25m swimming pool, a trainer pool, a library, leisure facilities, community spaces and council offices. Construction work is scheduled to start in spring 2012, subject to planning permission. South Acton Councillor John Gallagher (Lab) also went along to the Priory Centre yesterday. In his Council Report, Cllr Gallagher said 'Several members of Acton Swimmimg Club and Acton History Group were there with members of the residents' working group and Priory users. We stressed the points that we do not think Acton councillors are receving all the information to which we feel entitled and that Priory users must be adequately rehoused, especially if the building is required for a school before the town hall is completed. We also reminded officers that we want the Passmore Edwards library forntage retained." Writing on the ActonW3 Forum, some local residents expressed concerns over the plans. Shao-Ying Ben-Nathan wrote, "I went to see the consultation and one problem we discovered was that the rooms that they hoped would cater for the various community groups would not be able to accommodate a stage. 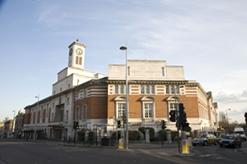 When it was pointed out that local schools and performance groups needed a stage, the project manager said they will have to use Ealing Town Hall. He knew nothing about the permanent martial arts class based in Acton Pools or where they would be placed in the new site, and also had no plans for a sprung floor studio which the priory centre has." The plans are currently available on the Ealing Council website and residents have until March 25th to make comments. To complete the consultation, go to www.ealing.gov.uk/consultations or contact Shehzad Ahmed on 020 8825 9234 or email ahmedshe@ealing.gov.uk.